ay riders "do you remember?" The second release, compilation of famous themes, covered by AY Riders. 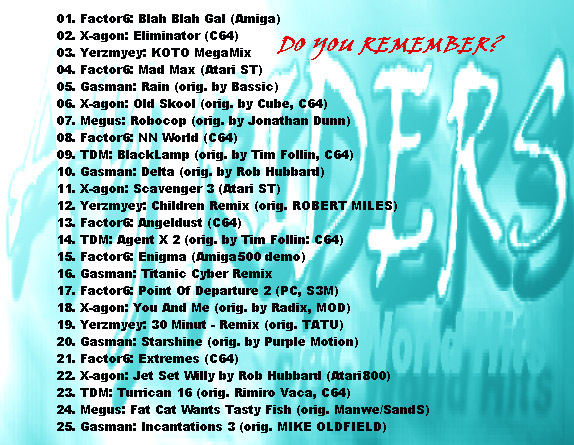 Tracks 1 (Amiga), 4 (C64), 8 (C64), 13 (C64), 15 (A500), 17 (PC), 21 (C64) covered by Factor6; 2 (C64), 6 (Cube, C64), 11 (Scavenger, Atari ST), 18 (Radix), 22 (Rob Hubbard, Atari800) by X-agon; 3 (Koto), 12 (Robert Miles), 19 (Tatu) by Yerzmyey; 5 (Bassic), 10 (Rob Hubbard), 16, 20 (Purple Motion), 25 (Mike Oldfield) by Gasman; 7 (Jonathan Dunn), 24 (Manwe/SandS) by Megus; 9 (Tim Follin, C64), 14 (Tim Follin, C64), 23 (Rimiro Vaca, C64) by TDM.